Good morning from Barcelona, friends! Oh my word. I wish all of y’all could be here… I don’t think I’ve ever seen a city so vibrant, beautiful or fun! Amanda, Macaughley and I hit a wall after our train ride from Seville yesterday… and no surprise, as it’s day seven of the trip, We truly have not stopped! But after a siesta, delicious sushi dinner and early bedtime last night, we are refreshed and ready to explore the city today! We’re heading on a bike tour, and can’t wait to get a feel for the layout of this city! Now, on to today’s look! Y’all know I am quite the fan of white-on-white ensembles. 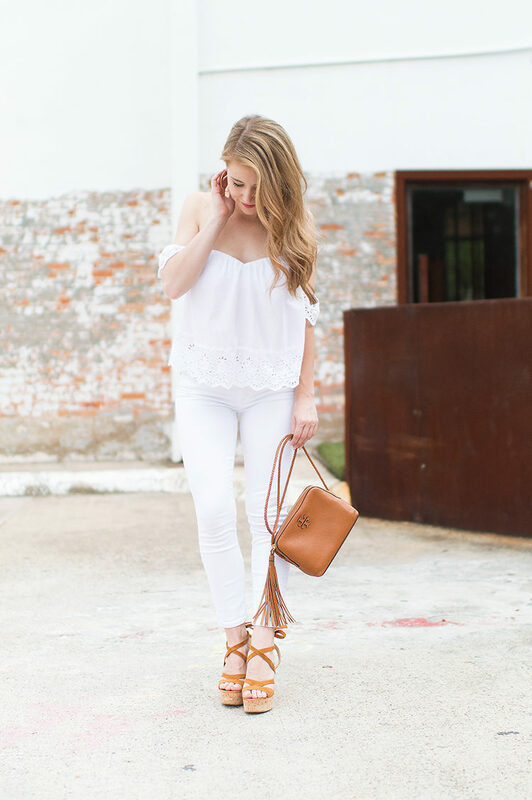 When I found this eyelet off the shoulder top, it’s the first look that popped into my head! I love how delicate and springy it is. 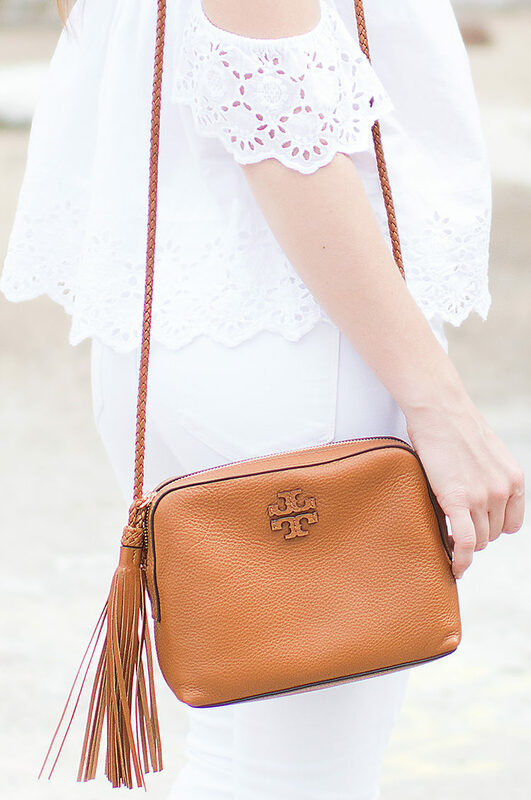 Switch out jeans for high-waisted denim cutoff shorts for another summery ensemble. You can’t go wrong! That’s a wonderful outfit! I’ve been seeing that eyelet pattern everywhere, it’s so pretty. And I love how you styled it with white jeans, it’s a gorgeous combo. 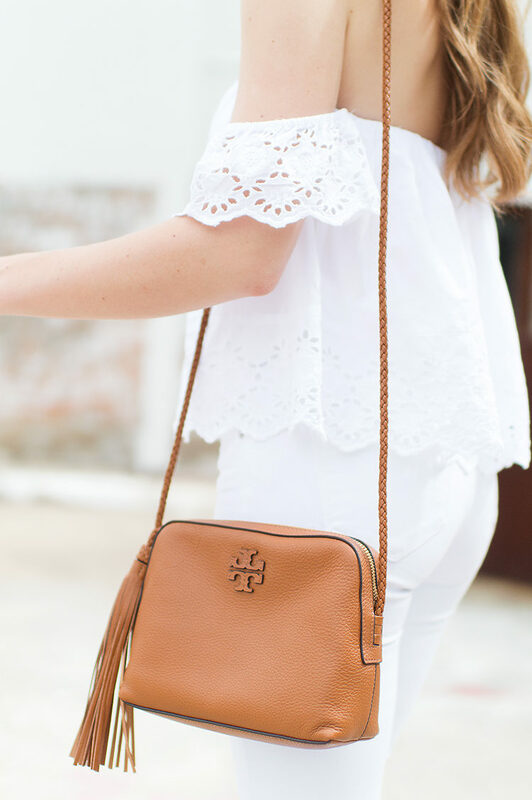 love this all white look! such a great top for spring and summer! I’ve been loving the slouchy off the shoulder trend lately (any OTS top where the sleeves are lower, does that even make sense haha?) This one is too cute! Your trip looks so fun! This top is so beautiful I love the detailing along the bottom.